Badam Payasam is the fav payasam of my whole family. The most flattering thing is that my parents-in-law always ask me to make this kheer for any auspicious occasion which demands 'sweet preparation'! So I have no reason not to prepare. 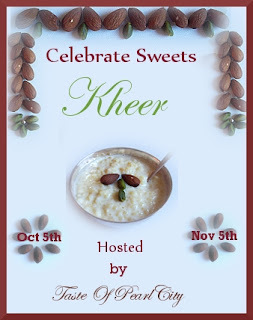 To make every occasion special go ahead and prepare Badam kheer and enjoy! Dry Roast Almonds and Cashews and grind them to a fine powder. Alternatively, soak almonds and cashews for couple of hrs and grind to a fine paste. In a heavy bottomed pan, boil milk and add the almond-cashew powder/paste. Add sugar and let keep stirring the kheer until desired consistency. I usually add a little custard powder (mixed well in a 2-3 Tbsp of milk) for extra flavor and thickness and the process of making kheer is faster. Note - I usually add boiled and mashed carrots to the kheer to increase the quantity specially for large gatherings. The carrots add a distinct color and taste to the kheer making it extra special. I am sending Badam Payasam to 'Celebrate Sweets - Kheer' event hosted by Taste of Pearl City which was started by Nivedita. Delicious almond kheer, feel like grabbing a glass rite now.. This looks awesome. Harini, thanks for letting me know about the bread. If you blog it, do send it to Bake-off.